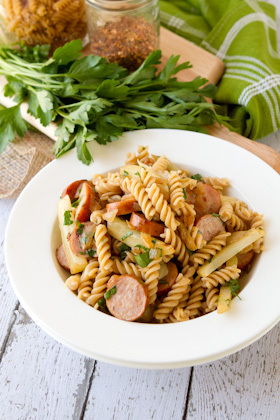 Setting the stage for Fall, this gluten-free pasta salad is bursting with the seasonal flavor of fennel and guarantees to have a bit of meat in every bite! Place fennel seeds in a large saucepan with 1 teaspoon of extra-virgin olive oil. Heat on medium-high heat for 1-2 minutes until toasted, rotating with a wooden spoon every 20 seconds. Add sliced fennel and onion. Cook on medium heat for 10 minutes, rotating every 2 minutes. Add sliced sausage and remove from heat. Set aside. Meanwhile, fill a medium-sized saucepan with water, cover and bring to a boil. Once boiling, add ¼ teaspoon of salt and fussili pasta. Cover and bring back to a boil, then remove cover and cook for 6 minutes, al dente. Strain and rinse pasta. Set aside to cool. Place all dressing ingredients in a blender and blend for 30 seconds, until oil is emulsified. 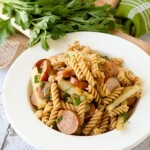 Place cooked fennel, pasta and dressing in a large bowl and stir to coat. Add in chopped parsley and serve.